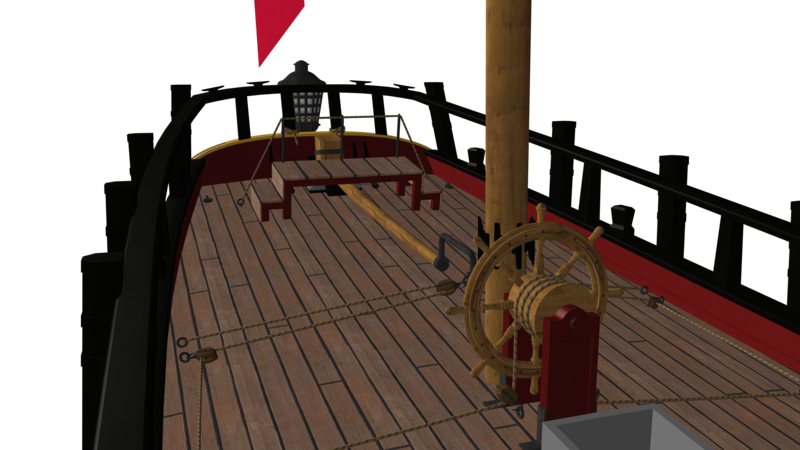 A lot has been done on our historical seafaring game Hearts of Oak over the past few months. And it is now time to start sharing our recent progress. Look forward to a new article each week! Welcome to the first edition of our new Hearts of Oak weekly progress articles! Each week, we will bring you a summary of the latest development news, including work-in-progress screenshots and in-game footage, along with a more in-depth look at featured content. As this is the first general update in several months, there's too much progress to cover in one article, so this week we'll stick to some of the highlights of recent development. This video demonstrates a simple damage system that causes ships to list and eventually sink when taking damage from cannon balls. At the moment, a ship will tilt in a random direction when taking enough damage, but eventually we plan to make this dependent on where the ship would be taking on water when its hull is breached. Here you can see the latest sound effects applied to cannon fire and damage, thanks to a generous donation of sound files. The video also touches on improved sinking effects and shot ballistics. You'll need to take the wind direction into account when firing! Here's something you don't see in many seafaring games: opening and closing gunport lids! Each lid is hand-placed, hinged and animated by the modeller, and this information is fed into the engine to create the awesome effect you see in the video. 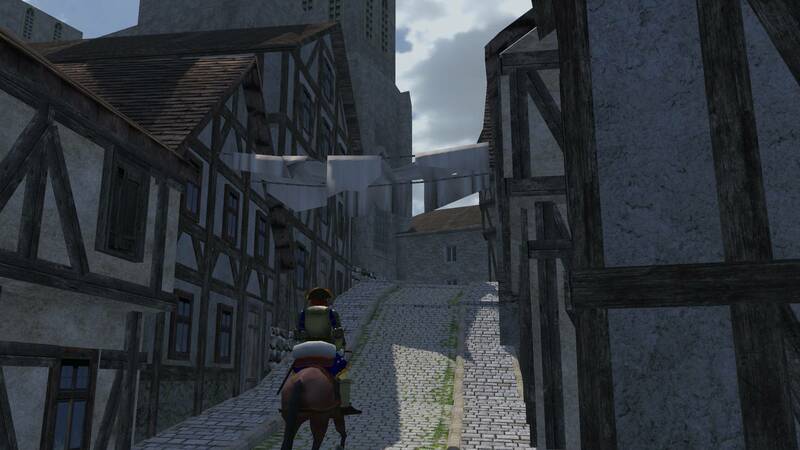 Thanks to a very generous donation, negotiated by Radetzky, we have acquired a large selection of buildings and other models that were originally intended for the cancelled Mount and Blade mod "Twilight of the Sun King". These are good quality models that will be incredibly useful for populating the game world early on, and we are very grateful to the modders involved in this donation! 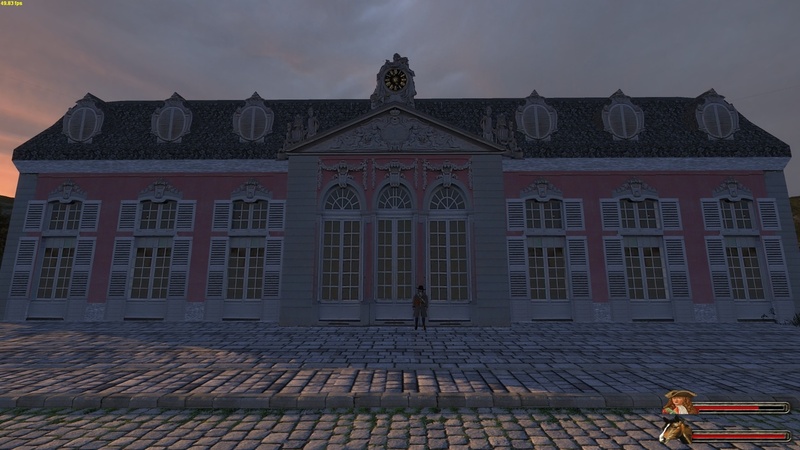 A highly-detailed tavern including full interior, modelled by SinKing, with further work done by Giony. Check out this video which shows a walkthrough of the building! A simple hut with a thatched roof. A beautiful French cathedral from 1736. RobinPC has recently been bringing our height map of Jamaica to life, starting to cover it in foliage and dense jungle areas that will all be explorable in the game. Expect to see more scenery added to this island soon, especially once we start getting a proper harbour set up! 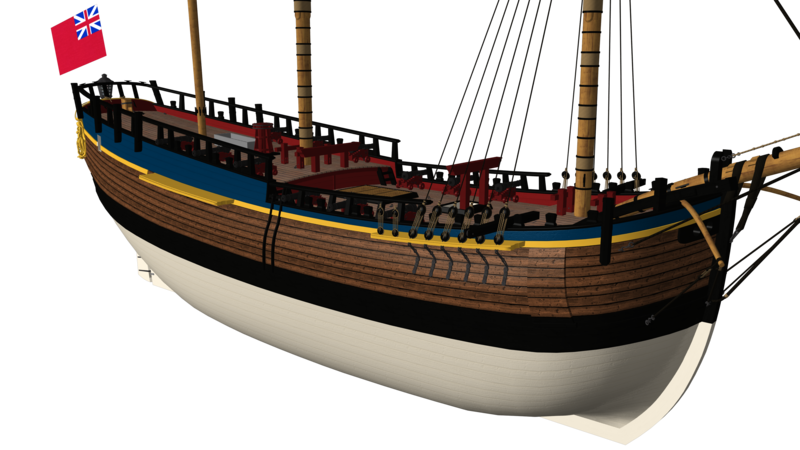 Hearts of Oak team 3D artist ODemuth has been building a highly detailed model of Captain Cook's bark Endeavour. The ship was built as the collier Earl of Pembroke in 1764, and was purchased into the Royal Navy and underwent alterations for his voyage in 1768. Her feats of exploration under Cook's command have made her famous, and as a result plans of her have been reproduced in high detail. She makes an excellent representative merchant vessel of the Seven Years' War era. We're still investigating the best way to run animations like these in-engine, so this might end up looking slightly different in the game. 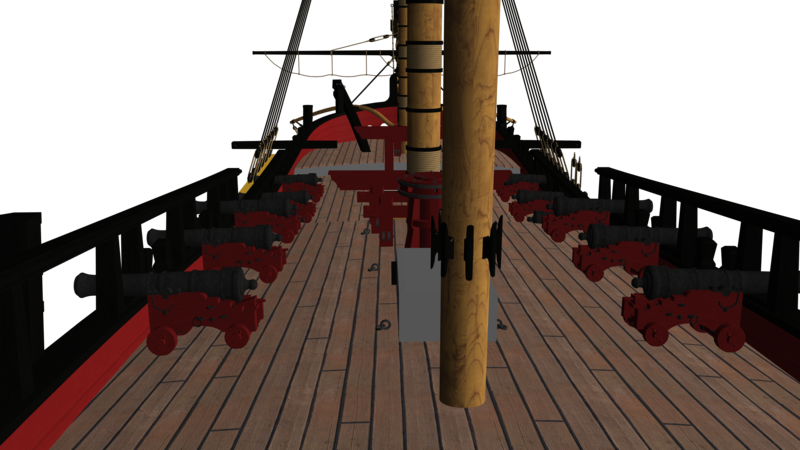 ... but below is a great image showing the difference between the boxy hull profile of an Indiaman (left) and the more rounded profile of a warship (right). This difference in hull shape will have interesting effects on a merchant ship's handling compared to a warship in the game. That's quite a name to get your head round! The famous Santisima Trinidad fought at Trafalgar, and was the Spanish flagship for many years. This version is how she would have looked when launched in 1769, and although not bearing her record-breaking armament of 140 guns until 1802, she's still a fearsome warship! This is an English gun, built to 1719 regulations, and cast in 1723. It was designed by the former Danish Artillery officer Borgard, who had affected widespread changes in the British artillery system. A beautiful gun that was carried aboard Captain Cook's Endeavour. To give you a taste of what's to come, we'll showcase an original track each week, produced by one of our talented composers. This week, we present "Post Captain's Lullaby", composed by Flannery. Ever wondered what the Hearts of Oak development video intro and outro music is? It's a theme based on a period piece of music and reimagined in Flannery's own style. Flannery has composed a significant number of tracks for the game, and although many are still sketches and not final quality, they're still worth showing off as a sample of the kind of style and atmosphere of music that we're aiming for in the game. Stay tuned for more original music next week! 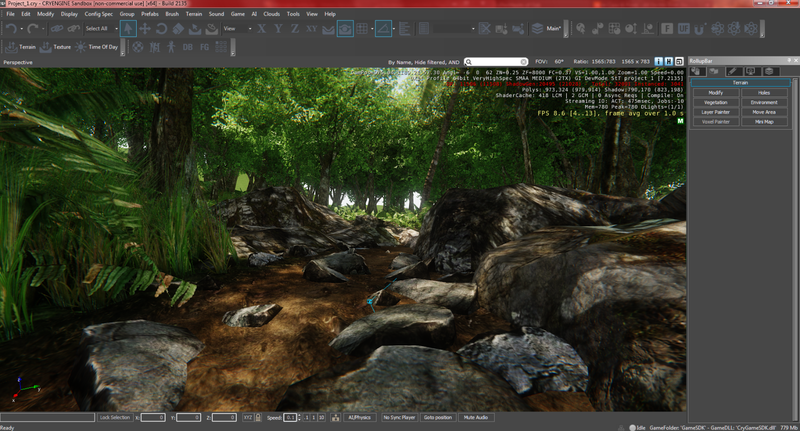 Wedori - For providing multiple extremely-high-quality models for tests within CryEngine. Their contributions have been invaluable to the game's development, and we hope to give out more of these awards in the coming weeks! Remember, we're a volunteer community and we can't make this game happen without your help! Do YOU have the skills and the enthusiasm to fill one of these roles? Head on over to our recruitment forum and introduce yourself! Do you know someone else that might be able to help? If so, please point them in our direction! That's it for this week's progress; be sure to join us again next week for more updates! This looks awesome guys! Such a cool game and some really amazing graphics work! I'm being overloaded with awesomeness! Looks really good so far, this is one of these game ideas i've always wished for since being young. Hopefully we can have it occur in 3D sailing mode, using the actual ship models. We haven't yet started development on that though. what happen with the awesome dutchman? Copyright wouldn't allow us to include Disney content in our own unique project. Is this based off mount and blade? 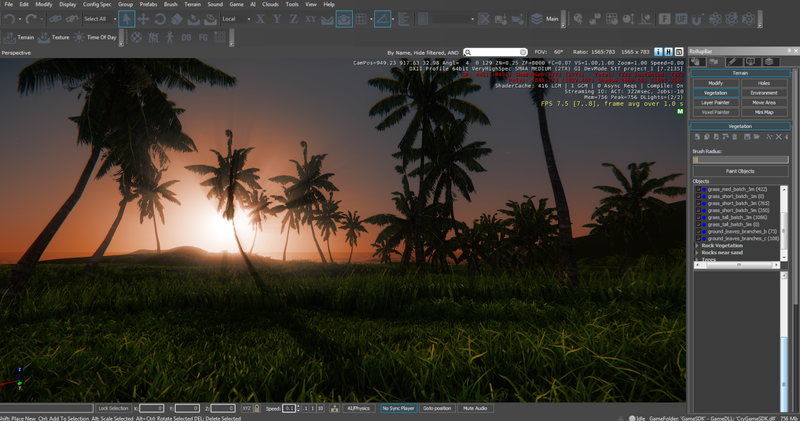 No, we're using the CryEngine to make a completely new game. 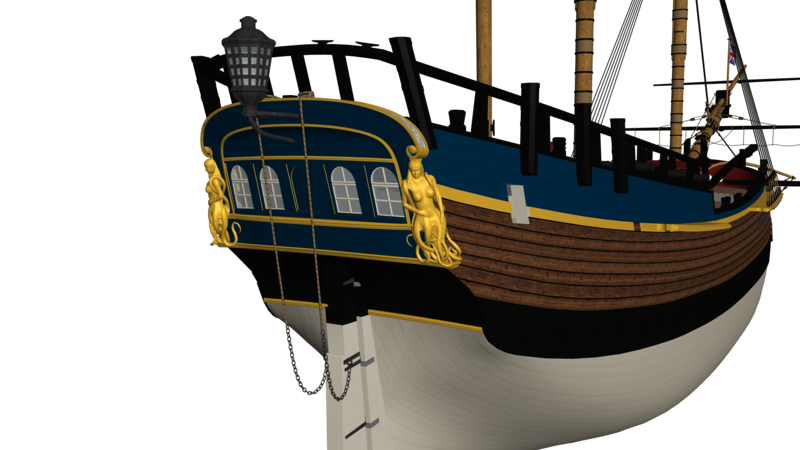 If anything, it is based on our modpack for the 2003 Pirates of the Caribbean game: Moddb.com . But Hearts of Oak will not be the same either; it will be BETTER! You are thinking of this game, which indeed is: Snowbirdgames.com . But that is not ours. Awesome. Loving the music and everything else. I'm looking forward to see those TOTSK buildings ingame.